The Camino de Santiago leading through the district of Lindau is part of Camino de Santiago of Munich respectively Augsburg. The Camino de Santiago between the Western Allgaeu and the Lake Constance invites you to come to peace, to reflect and to pray. Coming from Weitnau and Missen-Geratsried, we start our pilgrimage walk on the boundary Stiefenhofen in the district of Lindau (Lake Constance). We cross the stream Jugetach and reach the Alp "Rote Heide", passing "Abeles Alp" in a steep increase. On the small municipal road we continue our tour to the villages Trabers and Mutten. At the village exit of Mutten we turn left to the hiking trail Zell via the "Schwarzenbachtal". Then, the way leads us past the chapel Zell, situated on the boundary Oberstaufen, towards the mill Weißenbachmühle. 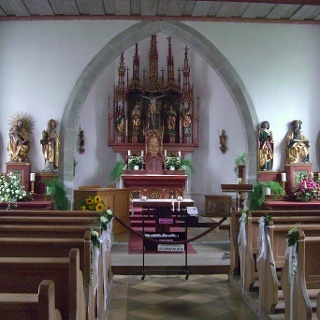 We cross the railway bridge and reach the village Genhofen with the well-known St. Stephen's chapel, passing the village Wolfsried and the riding school. After that, we turn left into the chapel path. Passing the sawmill on the right hand side, we head towards Aich and then towards Iringshofen to the left. Having passed the last farmstead, our way branches off to the right through the floodplain towards Hopfen with its St. Martin's chapel. The path passes the alpine dairy through the forest via the village Hinteregg to the village Burkatshofen. From there on a path leads back to the road called "alte Salzstraße". After approx. 1 kilometre we reach Nagelshub. Coming from Burkartshofen we reach Nagelshub. There, we follow the hiking trail R9/10. Shortly after, we turn left towards Simmerberg. In the village centre near the inn "Gasthof Krone" we take the road "rieder Straße" towards Weiler. Thereby, we pass under the alpine road "Deutsche Alpenstraße" and reach the centre of Weiler via Kapfmühle. In the area of the cemetery, the church St. Blaise and the Hausbach stream, the Camino de Santiago divides. 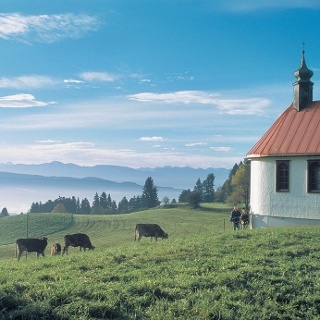 We choose the variant via Scheidegg where you find a pilgrimage centre with overnight accomodations. The second variant leads you via Lindenberg. We follow the stream Hausbach along the cemetery wall in a parallel way to the road Hausbachstraße and pass downwards the St. Wendelin's chapel. In the village Bremenried, we turn right into the road "Scheidegger Straße". Shortly before we reach the village exit, we leave the road towardss Altenburg to the left. Coming from Weiler-Simmerberg, the pathway runs from Altenburg (partly on the "Kneipprundwanderweg) via the village Forstenhäuser to the village Böserscheidegg. 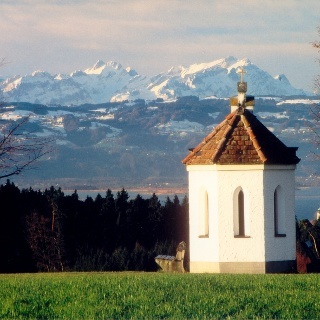 On the ecumenical chapel path "Pathways for body and soul" we walk towards the village Schalkenried (1 kilometre) with a marvellous panoramic view onto the Alps. In the village Ablers, we turn right and then uphill along the "Kurstraße". Passing the health clinics, we turn left at the mount "Blasenberg" towards the chapel of St. Gall. From here on, the route continues on the ridgeway ("Höhenweg"). This is one of the most beautiful panoramic trails of the Allgaeu where we have a unique panoramic view onto the mountains of the Allgaeu, of Vorarlberg, onto Swabia and Lake Constance. We leave the ridgeway turn left into the road "Hammerbühlstraße" (towards the spa house). At the end of the road we reach the road "Prinzregent-Luitpold-Straße". The spa house of Scheidegg lies directly ahead of us. Across the parking lot of the spa house, a small forest path leads us towards Ebenschwand/Skywalk Allgaeu (treetop path). At the end of the forest path, we follow the road to the left towards Ebenschwand/Oberstein. We pass Ebenschwand, follow this road and finally turnn left towards Oberstein. Before we reach Oberstein, we turn right onto the road "Kolpingweg" towards St. Ulrich's chapel/Möggers. From Möggers, we continue our tour to the mountain Pfaender (1062 m) via the Pfaender ridgeway. Starting at the Pfaender railway station, the way leads southward downhill to the village Fluh. Passing the mountain Gebhardsberg and the parish church St. Gall the way leads down to Bregenz. Up to now, there is no official Camino de Santiago from Bregenz towards Switzerland. However, there are the common hiking trails. In the course of a leader project, the gap closure to Einsiedeln via Appenzell is planned, where the path comes upon the Rohrschach Camino de Santiago at the village St. Peterzell. Until then, it is recommended to use the hiking trails via Lustenau and Altstaetten to St. Peterzell.